Click here for information regarding contract parking. 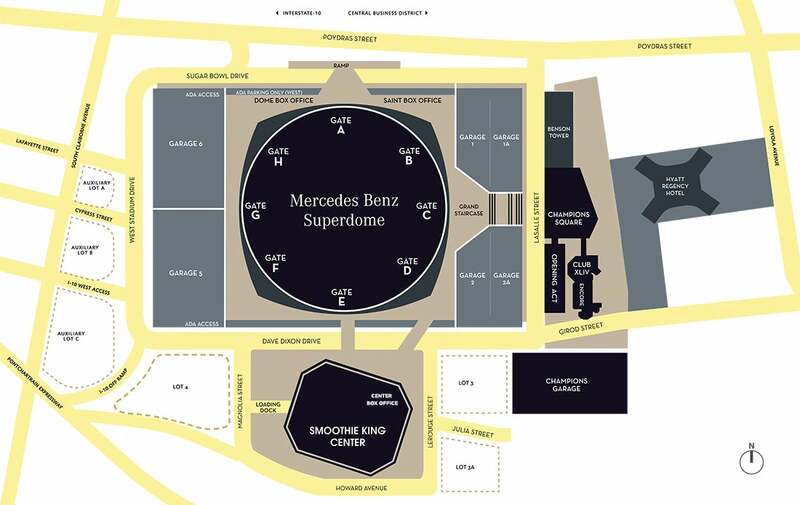 The Mercedes-Benz Superdome is located at 1500 Sugar Bowl Dr. in New Orleans, LA. The SMG managed complex has a total of seven (7) parking garages for public parking and two (2) surface lots, which can accommodate approximately 7,000 vehicles. The parking garages and surface lots are adjacent to the Mercedes-Benz Superdome and the Smoothie King Center. The public parking garages are designated #1, #1A, #2, #2A, #5, #6 and Champions Garage. The surface lots are designated as Lot 3 and Lot 4.